Terrier Real Estate is moving and expanding! 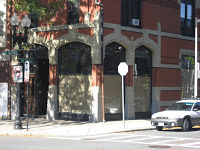 I am proud to announce that Terrier Real Estate has bought a new office at 366 West Broadway in South Boston and will be relocating January, 1 2010. The new office is located at the corner of West Broadway and E Street. It's a great corner retail space that I actually blogged about last year when it came available for sale or lease. Terrier Residential, a Boston residential real estate company, has relocated to 366 West Broadway, Unit C-2, in South Boston. Owner Michael Sylvia purchased the 1,024-square-foot commercial condo for an undisclosed price. If you are a new or experienced agent, we are hiring, so feel free to contact me. Stay tuned for details on our grand opening party in January 2010.